Even after 26 years in Australia the kangaroo still amazes me whenever I see one. On my recent camping trip, after a morning of rain, confined as I was to my little but thankfully dry tent, the skies were clearing and I could get up to meet the world outside. As I unzipped the tent door being careful not to let any water inside, I was greeted by a whole family of roos grazing and generally lazing about. 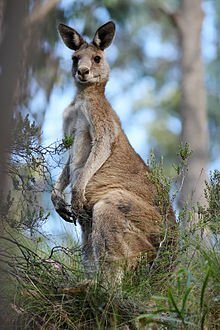 There are many different kinds of kangaroos; at home on the Gold Coast we often have little wallabies visiting, but these were the big greys, and closest to me, maybe 4 or 5 meters away was a rather imposing looking male, standing tall as I did, rather warily. The big fella and his mob (yep, that’s what a flock of kangaroos are) wasn’t too perturbed, though, no doubt well used to the presence of two-legged non-jumpers. A couple of joey’s, not long out of the pouch were quite curious, watching intensely as I was making breakfast. One of them particularly fascinated by the kettle boiling, maybe even tempted by the smell of the freshly made coffee. The big fella, dad, clearly decided I was no threat and got up, skipping away, covering 10 or 12 meters in 2 or 3 jumps like in slow motion, then he was gone. I sat and observed the others for quite a while and it struck me that the graceful motion of a kangaroo skipping is quite a contrast to when they graze. Their long tail and huge hind-legs seem to be in the way as they clumsily move around defying their shape to pick at the grass. Watching the mother roo and the joey I also noticed that despite her seemingly relaxed demeanor, she is keenly aware of every movement and sound, her big ears up and forward as she sees and hears everything. 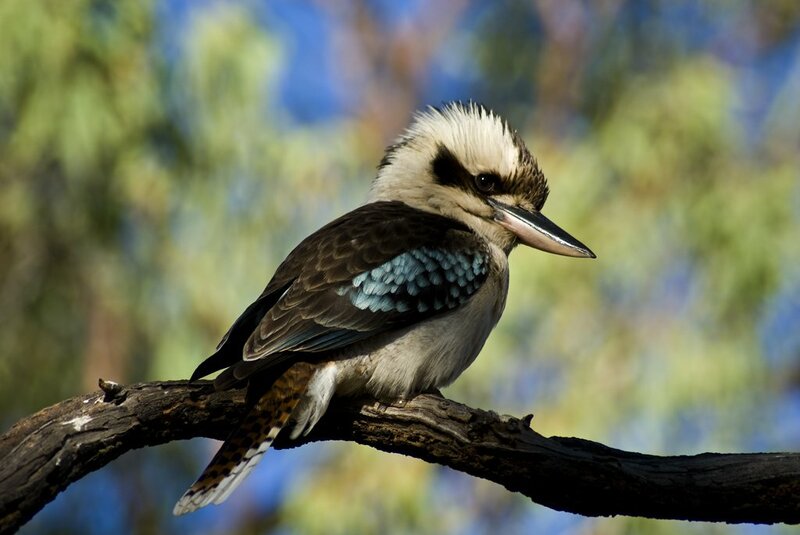 The sudden laughter of a kookaburra startles her, suddenly upright and on alert as if she heard it for the first time! As I clean up after my breakfast making sure I move slowly and quietly, the kookaburra silently descends on a branch just above my tent, seeing if I have any scraps to throw his way. He is a magnificent bird, big and strong, blue beak and blue and white colouring, highlighted by a brown, black and white tail, gently bobbing up and down as he balances, utterly sure of himself, without a worry in the world. Well may you laugh kookaburra, you truly are the king of the bush!